The 2015 Wyoming high school football season finishes with five state championship games this weekend. 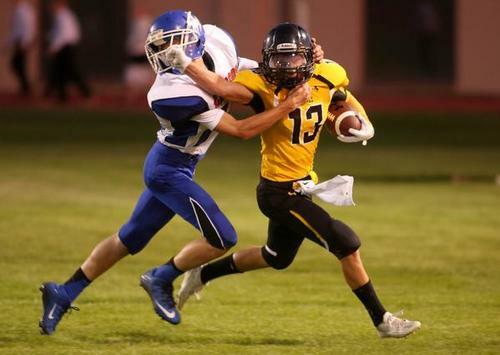 Follow the action here and include your updates and comments with #wyovarsity on Twitter. Keyshawn Farmer with a kickoff return TD for South! Unreal! 46-36 South now. 3 TDs in about 20 seconds. Final: Hulett 62, Midwest 14. Good one developing in Converse County. After 3Q, Douglas 36, Riverton 29. Rock Springs just recovered an onside kick. As I said...South plays the most exciting games, for better or worse. The Camels dominate Homecoming and Senior Night beating Laramie 51-16. Final: Southeast 51, Lusk 18. Douglas 42, Riverton 36. Late in Q4. Hoopman from 43 yards for TD for Douglas. Back up to two-score game and that should wrap it up for Bearcats. Up 48-36. Final: Douglas 48, Riverton 36.